Be ready when your sun comes up. When you're working in the fast lane of Solar Car development, you can't lose time waiting for your PCB designs to be prototyped. 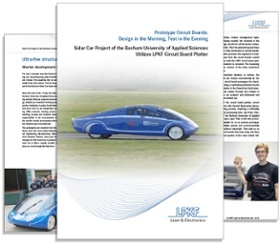 This case study shines the light on how the LPKF ProtoMat S63 circuit board plotter sped the team at Bochum University of Applied Sciences through the finish line of their state-of-the-art SunCruiser.